Life Research Papers loos at a short story by Bessie Head about a life in a small South African village of a woman. The short story, “Life”, by Bessie Head paints a picture of life in a small South African village just outside of Johannesburg. It is a character study with several underlining themes. 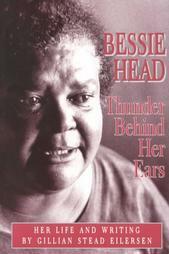 If you need a literature project written about any of Bessie Head's works, have the writers at Paper Masters help you succeed! Briefly, the story’s main character is Life. Life was orphaned at a young age and made her living in Johannesburg by singing, modeling and the more glamorous professions of the city. These professions fit Life’s personality, which was boisterous, carefree and easy-going. When life was twenty-seven, she moved back to her small, native village just outside of Johannesburg. Here she found that she did not fit in with the women of the village. However, life was resourceful and became the first prostitute the village had seen. Shunned by the farming women, life set up business and friendship among the beer-brewing class of women. They enjoyed Life’s spirit and she brought a bit of luster into the dull village life. Only a short time after life arrived in the village, a wealthy cattleman named Lesego, noticed her. He was taken in by the fact that she was different and offered to marry her. The men of the village and his friends advised him against it, but he did not heed their advice and Life and Lesego married. Lesego was a harsh man and demanded that Life conform to the ways of a good village wife, henceforth, remain faithful to him or he would kill her. Life attempted this, but quickly became bored with the mundaneness of village life. Life began to rebel and see other men. Life decided she had enough of married life and rebelliously began sleeping with other men. Lesego returned from a trip early one afternoon and implored his wife to make him tea. She lied about needing to go to the store, and left for the bed of another man. Lesego’s neighbor reported this to him and Lesego went to the home of the other man with a knife in his shirt. Upon finding Life in bed with another man, he bludgeoned her to death. Lesego was charged with murder and sentenced to 5 years in prison. The theme that Bessie Head presents is that two worlds can not collide. She blatantly states this when Lesego proclaims to his friend that “There are good women and good men but they seldom join their lives together. It is always this mess and foolishness…”. Paper Masters writes custom research papers on Life and look at a short story by Bessie Head about a life in a small South African village of a woman.